This is a popularity analysis chart a.k.a menu engineering matrix that is provided to take business decisions based on number of units sold, gross margin, contribution to overall sales in a given data range. 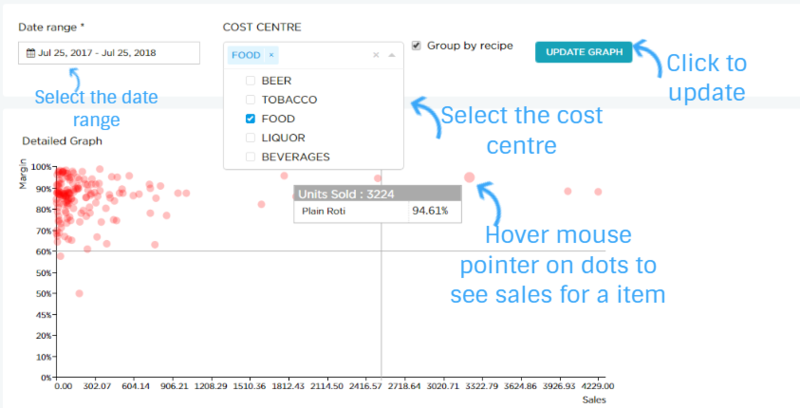 Filters based on categorization applied to your menu items is provided for deeper analysis. A graphical representation is shown which is plotted based on sales and gross margins. A tabular representation is shown for detailed view. Note that menu items not linked to recipes will not be listed here. Group by recipe: If there are multiple menu items (JW Black Label Large, JW Black Label Small) linked to the same recipe (usually in case of liquor, beer) use this option to show only one menu item (JW Black Label) as opposed to two. Intent of this chart is to identify laggards, stars, puzzles and plow-horses and take quick business decisions. For e.g. an item in left bottom quadrant (laggard) is neither selling a lot nor providing high margin. Items falling under puzzles (top left) are generating high margins but not that popular. Are you upselling them enough ? The ones on bottom right are doing well but not very profitable. How can you make it work better for you? Either reduce the portion size to bring down the cost or increase the selling price. Sometimes due to the nature of the market and price sensitivity you may not be able to increase the selling price. But as a business owner you need to take some tough calls to maintain your overall profitability. If you see gross margin less than or equal to 0, there is something wrong with that recipe. If your cost price is more than selling price, the gross margin will be negative. As you can see, the recipe for Filter Coffee is wrong. 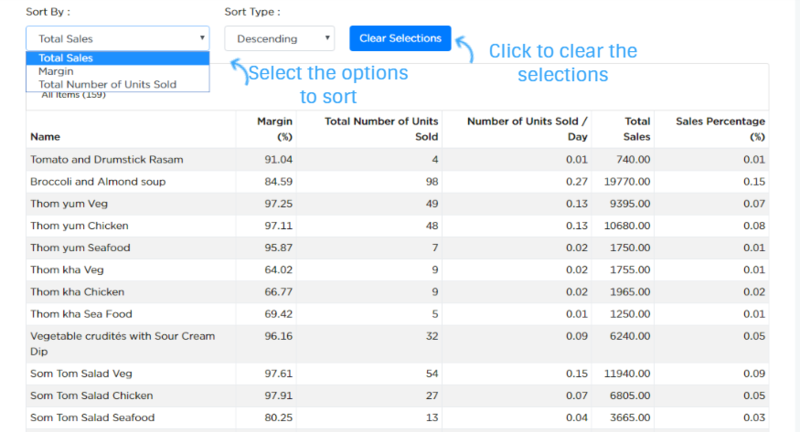 If you find items with blank gross margin, it is again due to an incorrect recipe. Either selling price is empty or cost price is absent.